1. Use the material reclaimer machine to collect the semi-solid waste into the measuring conveyor and then transit the semi-solid waste to big dip angle belt conveyor. 2. 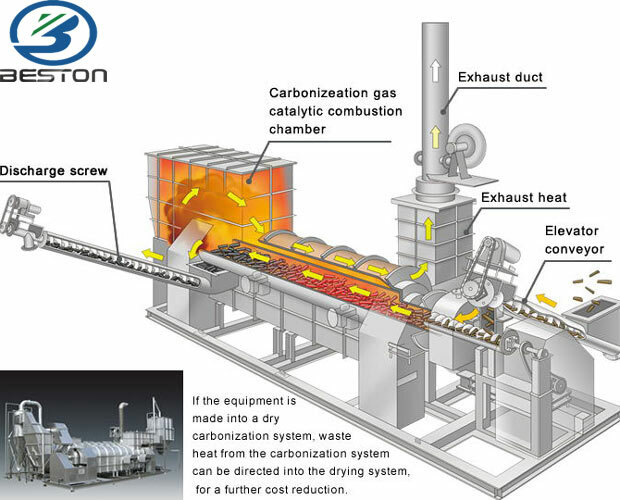 The semi-solid waste freely falls inside the carbonization machine and be dried out for the second time. 3. Then falls outside bin of the machine and starts the high temperature pyrolysis, sulfur emission, flue gas volatile, carbon focused carbide process. 4. The carbide be discharged by the water-cool conveyor. 5. The rest hot flue gas and heat be led to the desulfurizing tower by the fan, experiencing the first and second desulfurization process. 6. The rest hot flue gas and heat be led to the smoke tower by the fan for first and second smoke abatement process. 7. The smoke abatement and desulfurization steam will be condensed by the condenser and led to the recycle water pool. A: Use as the fuel with the coal. B: Sell in the market as the fuel with the coal. C: Fill some construction material to produce road water permeable brick. D: Use as the active carbon for waste water recycling. E: Use as the carbon based organic fertilizers for the garden and plant. F: Use as the active carbon for other usages.